There’s a spark in Iron Man 3 that has been absent in the previous two- the magic of this third installment is its ability to culminate every bit and piece that made Marvel’s predecessors so infectiously watchable and exciting, yet managed to make it so entirely new. I’m admittedly a huge fan of the Iron Man franchise–Marvel as well but I have a special place in my heart for the troubled and snarky Tony Stark–it’s the superhero that thrust me into the Marvel universe and captivated my interest. It took a third tier superhero and brought him to the forefront, his flaws and personality defects alike and made him not cool but also a timeless hero. It was a hero that despite his wealth, his looks and his status was relatable because he wasn’t a man born with unnatural strength or super speed but instead built his power with his mind and scraps of metal in a cave, cut from any ties of his home and only as a means of survival. He then used that machine to right the wrongs he’d committed, and slowly but surely it turned out that Tony Stark and Iron Man were hardly decipherable at all but rather the same being sharing the same brain. These are issues that Iron Man 3 addresses, as well the anxiety a man with no such powers would have to deal with after flying straight into an alien wormhole and somehow managing to survive it. The script by Drew Pearce and Shane Black and Robert Downey Jr.’s performance humanize a larger than life character. It’s an intelligent and surprising take on a franchise audiences believed they knew in-and-out. Re-introduce our character, introduce the threat, show the hero failing at defeating the threat until the huge standoff where he saves the day, gets the girl, and all is well. Director Shane Black (possibly the smartest decision Marvel and Kevin Feige have made in regards to the series since casting Downey himself) has taken the typical beats of a superhero film and given them their own twist infusing a sense of urgency, dark humor and pure joy all the while keeping them similar enough so that it still felt like a superhero film. The film begins with Tony who’s now suffering from debilitating panic attacks after New York, which has lead him to spending most of his time building more suits in case of any imminent threat that may or may not befall them. It’s also caused rifts between him and Pepper (played by the most likable version of Gwyneth Paltrow), a relationship that’s often been the secret beating heart of the franchise. There aren’t many other superheroes in the movies that have had long lasting relationships. His world is thrown into turmoil when the Mandarin, a terrorist-like model, wreaks havoc on Tony and his world. When his good friend Happy Hogan is injured on the job, Tony recklessly takes matters into his own hands and threatens the Mandarin directly, egging him on in typical Stark fashion. This proves to be a poor choice when the Mandarin takes him on his threat and guns down Tony’s mansion, creating one of the most visually innovative scenes Marvel has done to date. Think of that moment in The Avengers when the camera swoops around the gang facing the improbable incoming invasion: watching Tony struggle into his suit as the bombastic score blares and his world literally comes crashing down around him is just as thrilling but with a greater emotional tug–all that’s missing is the Hulk, Captain America and the gang. This sets off the rest of the film’s plot, including the chasing of the Mandarin, Extremis and a drug that can either strengthen a body or blow it apart, and a movie that more than a little bit resembles Black’s previous outing with Downey in Kiss Kiss Bang Bang. This movie also succeeds in the time it has Tony in the suit, or rather, out of the suit. It shows the man back in the cave, using what he has to win and fight back. There’s also hardly a moment when he isn’t battered or bruised, which heightens the human element. He is breakable. The supporting cast is all solid with Guy Pearce and Ben Kingsley getting the best usage of their screen time as Rebecca Hall gets the shaft. Don Cheadle is back as Rhodey and proves to be of more use in this film as he and Downey team up in a great buddy cop like relationship. As mentioned above, Paltrow is the most likeable she’s been in years as Pepper Potts, a character who gets a great amount more of screen time and development in this film than the previous two combined, sharing a naturally effortless rapport with Downey. 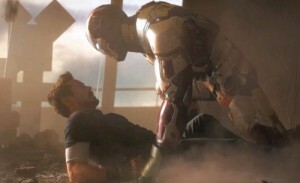 But this is, like always, Tony Stark’s show and Downey’s skill and charm as the character has never been better used. It would be easy to tire of a character we’ve already seen in focus in three other Marvel films and in brief in a fourth and yet Downey manages to make this outing the most refreshing and the most interesting to watch. It’s the same character, it’s the same snark and ego, but it’s a version of Tony who has been humbled, who’s shaken and scared from past events, and Downey is allowed to explore a range of emotions that he hasn’t yet been able to use in the past versions of his character. He has made Tony Stark so insanely watchable that it isn’t hard to imagine a fourth film, despite this one wrapping things up quite nicely. The job of the superhero movie is to primarily entertain and secondly create a connection that should seem impossible with such enormous personalities. A man in a tin suit isn’t easy to relate to. Yet Shane Black’s film is quick witted, thrilling, emotionally satisfying and action packed. I don’t think I could ask for anything else, and all I could think when leaving the theater was how sad I was that it was already over. It’s the best of the three, get out there and make sure you see it for one of the most enjoyable movie experiences you’ll have this year.